Download and install Virus Activity plugin! Virus Activity is a free WordPress plugin that displays newest malware in your sidebar or footer. Virus Activity is a free WordPress plugin uncovering the most active viruses of Windows, Mac and Android OS. It displays daily reports of the overall virus activity and the newest cyber infections detected by Kaspersky Labs, Norton, Avira, and similar security giants. This plugin adapts itself to your website’s design automatically but it can also be configured according to needs. Let your visitors know about the latest viruses and help them protect their computers! 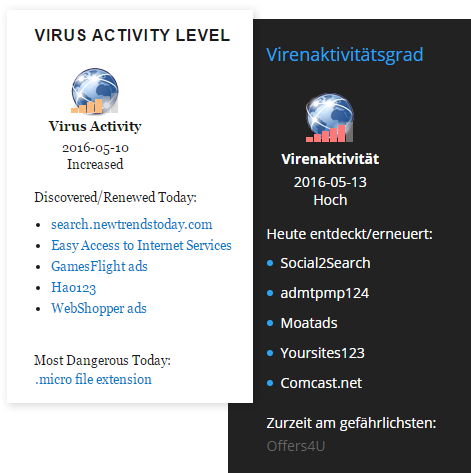 Virus Activity plugin adapts itself to website’s design and colors automatically. However, it can be changed according to your needs. It goes well with responsive design. The plugin renews itself daily to let your visitors know virus activity in the entire world and the latest virus tendencies. The plugin is translated to 25 languages, including German, French, Spanish, Portuguese and other languages. Virus Activity plugin is available at WordPress Plugin directory. 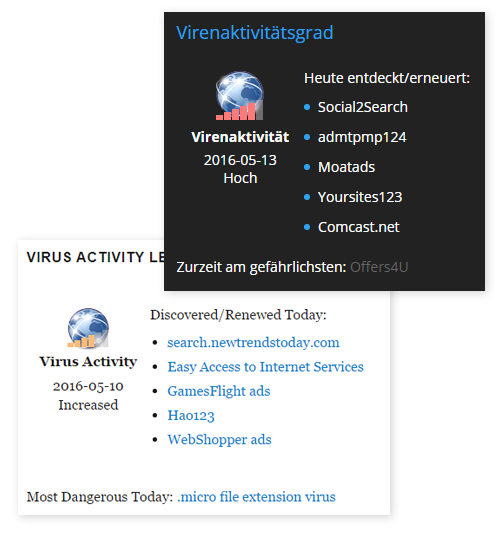 To add Virus Activity plugin to your site, just install and click “Activate”. Download today and provide your blog readers with the newest information about computer security worldwide! © 2016 Virus Activity. All rights reserved. WordPress and other trademarks, trade names or company names referenced herein are used for identification purposes only and are the property of their respective owners.